Arie Leonard Williams, son of Henry Grady Williams and Sarah Inez Whitmore, husband of Ethel Louise Howell. Ethel Louise Howell, daughter of Howard Charlie Howell and Mary Louise Moss, wife of Arie Leonard Williams. 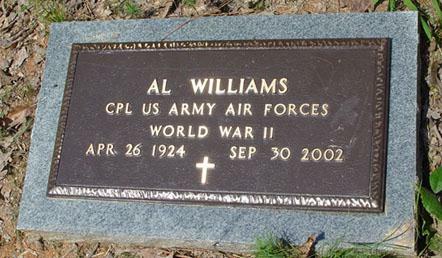 Mr. Arie Leonard "Al" Williams of Woodstock, GA died peacefully at home on September 30, 2002. 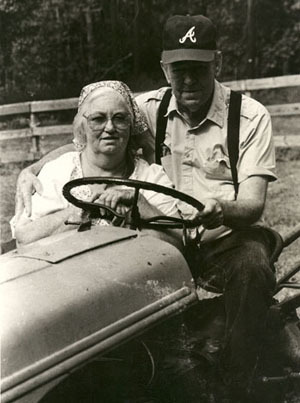 He was born April 26, 1924 in Cherokee County, GA, son of the late Henry Grady Williams and Inez Whitmore Williams. 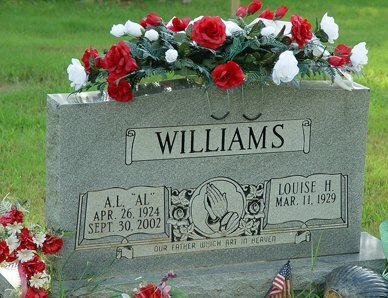 Mr. Williams was preceded in death by brothers, James Williams, Fred Williams, Hoyt Williams and Albert Williams, as well as sisters, Lucille Mulkey and Geneva Nealey. Mr. Williams joined the U.S. Army Air Corps on January 7, 1942. After honorably serving his country, Mr. Williams worked as a car salesman, gas station and restaurant owner before settling on a thirty year plus career as owner of an electrical contracting company. He passed his knowledge onto his four sons and countless others. Survivors include his beloved wife of over forty years, Louise Williams; four sons, Nick Williams, Henry Williams, Scott Williams and Allan Williams; two daughters, Suzie Rainwater, and Hope Williams; nine grandchildren, Nick Williams, Jr., Eric Williams, Timi Rainwater, Jessica John, Bret Williams, Alex Williams, Quenton Williams, Tyson Williams and Brandon Williams; nine great-grandchildren; brothers, Harold Lloyd Williams and Kenneth Williams; and sister, Elaine Grant. Funeral services will be held at 2:00 P.M. Wednesday at Sosebee Funeral Home Chapel with Rick Templeton officiating. Interment will be held in the Old Macedonia Cemetery, Bartow County. Mr. Williams will lie in state at Sosebee Funeral Home in Canton until services. Pallbearers will include Roger Williams, Nick Williams, Jr., Gary Nealy, Eric Williams, Troy Williams and Michael Johnson. The family deeply appreciates your thoughts and prayers at this time. Sosebee Funeral Home in Canton in charge of arrangements. 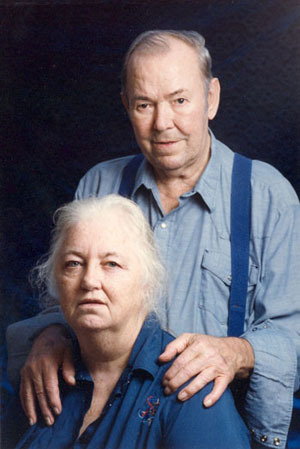 Mrs. Louise Howell Williams, 77, of Cartersville passed away Sunday, Feb. 4, 2007, at her residence. Funeral services are scheduled for Tuesday, Feb. 6 at 11 a.m. from the Sosebee Memorial Chapel with the Rev. Richard Templeton officiating. Interment will follow in the old Macedonia Cemetery. She was preceded in death by her parents, Howard and Mary Howell; husband, Arie Williams; and son, Scott Williams. Survivors include her loving children, Henry Williams of Cartersville, Allan Williams of Roswell and Nick Williams of Kennesaw, Hope Williams of Woodstock and Suzie Rainwater of Ball Ground; sister, Sylvia Williams of Acworth; nine grandchildren and several great-grandchildren. Serving as pallbearers will be Tyson Williams, Brandon Williams, Nick Williams Jr., Troy Williams, Michael Johnson and Danny Hight. Honorary pallbearers will be Alex Williams and Quenton Williams. Sosebee Funeral Home of Canton is in charge of arrangements.